TPU found pics and details of the ASRock X79 Extreme6/GB, a new mainboard that offers eight DDR3 memory slots. ASRock kicked off its "Sandy Bridge-E" compatible motherboard series with one of the most complete lineups, including a micro-ATX model. It did include some oddities, such as the X79 Extreme7, with its six DIMM slot arrangement. Socket LGA2011 Core i7 processors embed a quad-channel integrated memory controller, and so it's only logical to either have one DIMM slot per channel (four DIMM slots in all), or two DIMM slots per channel (eight in all). ASRock unveiled its latest addition to its X79 Extreme family, the X79 Extreme6/GB, which sets this oddity straight, while creating another. This model is supposed to be a notch inferior to the X79 Extreme7, yet it provides eight DIMM slots (two per channel). Other features, however, are consistent with those of the cheaper X79 Extreme4. 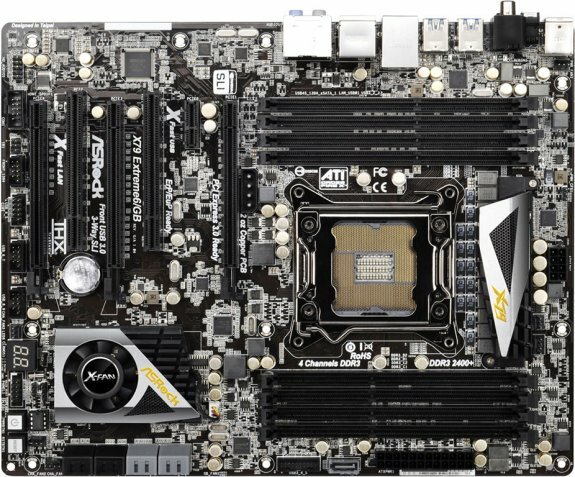 So it's safe to call this ASRock's answer to MSI's recently-launched X79A-GD45 8D, a relatively cheaper X79 motherboard with eight DDR3 DIMM slots. 8 DIMM slots stopped being a thing of the "premium" (again, relatively), the moment Intel launched a $210 X79 motherboard that features it, the DX79TO.